What is a high arch? Someone with a high arch has more space under their medial longitudinal arch than normal. A high arch is generally present from a young age, however may appear after injury or in the presence of a neuro-muscular disease (ex. Charcot Marie Tooth disease). Lowering of the arch is required during walking to absorb shock from the ground. People with a high arch, generally place most of their pressure when walking on the ball of the foot and on the heel. A pounding sound may be heard when they are walking due to increased pressure on the heels. A Chiropodist will examine your feet sitting, standing and walking to determine if you have a high arch. 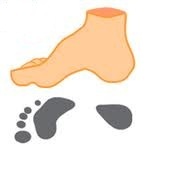 They can provide information on which shoes are best to help absorb shock, prescribe custom foot orthotics to help redistribute pressure and treat any foot problems that occur secondary to a high arch, such as corns/ callus.